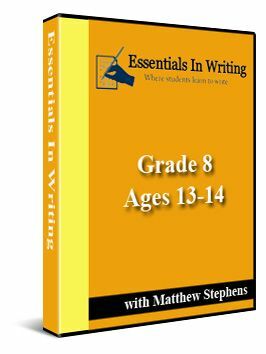 Essentials in Writing is a complete language arts program founded and created by Matthew Stephens, a former middle school English teacher. With a primary focus on composition, students will learn to write confidently and effectively by watching Mr. Stephens teach brief lessons in a step-by-step fashion. After the material has been presented and modeled, students complete worksheets and/or writing assignments on their own. Included in each grade level of the Essentials in Writing program are the video materials which are shipped in DVD format and the downloadable workbook files which are delivered electronically in PDF format as soon as you place your order. The cost for each grade level is $40.00. There are pre-printed workbooks available for an additional $20.00 for those who do not wish to print each worksheet/assignment individually. My oldest son and I had the privilege of reviewing Grade 8 (Ages 13-14). Starting in eighth grade there is a shift in learning - writing becomes the primary focus while grammar becomes supplemental. Grammar review is included if the student needs it, but only the video component is provided. There are no accompanying worksheets or assignments. There are a total of 64 lessons. Lessons 2-5 cover independent and dependent clauses and compound and complex sentences. Lessons 6-12 cover prepositions, appositives, figurative language (onomatopoeia, simile, metaphor, personification, hyperbole, and imagery). Lessons 13-17 cover paragraph structure and writing different types of paragraphs (formal, expository, descriptive, persuasive, compare/contrast). Lessons 18-20 cover the writing process, point of view, and mechanics of dialogue. Lessons 21-25 cover the writing process of a personal narrative. Lessons 26-27 cover writing a summary. Lessons 28-31 cover writing a compare/contrast business letter. Lessons 32-39 cover parts of a formal essay and the writing process of a persuasive essay. Lessons 40-49 cover choosing and narrowing a topic and the writing process of an expository essay. Lessons 50-64 cover the process of writing a research paper. Also included at the end of the lessons are a sample research paper and an answer key to all worksheets and assignments. To get an overall feel for the course and for review purposes, we didn't complete the lessons in order but skipped around a bit. First, my son spent some time reviewing clauses and different types of sentences (compound/complex) in the first few lessons. My son used Essentials in Writing on a daily basis and was able to complete several lessons in a week. The time does vary, though, depending on the number of assignments in a lesson. I imagine writing a research paper will take far more time since there will be quite a bit of research involved. For my son this will continue to work well as a self-paced course. I don't plan on assigning a particular number of lessons per week. I will have him go back and do the lessons he skipped for review purposes and move on from there. I really like that the lessons are presented on video in bite-sized chunks. I think it keeps the subject of writing from becoming too overwhelming. Mr. Stephens does a great job of showing the student the concepts he is teaching. When I asked my son if he liked Essentials in Writing he just shrugged his shoulders and said, "Well, it's just like any other writing program." Actually, my son has had the privilege of being exposed to several different writing programs, but this is the first one that has had video instruction. And I did manage to get out of him that he likes that part of it. The problem with my son isn't that he doesn't like to write. He does. In fact, he's in the process of writing a fantasy/fiction novel in his spare time. I think the problem is that my son is probably like a lot of kids who just don't like learning the mechanics and formalities of writing - all the necessary stuff. In my opinion, all that necessary writing stuff is, well, necessary. I often supplement our main writing/English curriculum with creative writing courses and assignments, but building a strong foundation is essential, and that's why I feel confident recommending Essentials in Writing as a primary writing curriculum. Even though my fifth grade son was not the one reviewing Essentials in Writing, I thought I would share what he had to say. He came to me one day and asked, "Will you still have this program when I'm in eighth grade?" "Because I've been watching a lot of the videos, too, and this is what I want to do." What better recommendation can I give than that? Looks like I may be looking into buying the sixth grade program for him this fall. Click to read more Essentials in Writing reviews from the Schoolhouse Review Crew.